An elegant very small weeping tree with bright green slightly twisted leaves and slender catkins in spring. This is a dwarf top grafted tree which will only ever grow slightly taller than the height when supplied by us - to approx 1.5 x 1m in 20 years - so it is ideal for patios, containers, and small gardens. 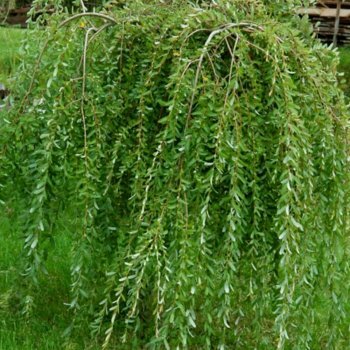 Dwarf weeping willow is good in any soil, in sheltered sunny or semi shade positions and like all other Willow trees, good near water in damp soil. Click here to go to all Willow trees. Our pot grown dwarf Weeping Willow trees can be planted at any time of the year. Start by removing weeds and grass within a metre of your desired planting hole. Dig a square hole as deep as your root mass and approximately 2x as wide. To help the tree establish more effectively, sprinkle root grow in the hole. Remove the pot, gently loosen the roots and place in the planting hole. Mix 50% of the original soil with 50% compost, fill in the hole and firm around gently. Avoid banking the soil up around the collar of the tree. We recommend planting Weeping Willow with a stake and tie kit - instructions are in the planting guide. Allow young dwarf Weeping willow tree to grow unpruned for the first year. This will give it the time it needs to develop a natural shape. From then on you can prune damaged, or diseased branches at any time of the year. To encourage a clear stem, prune the lower branches in winter.